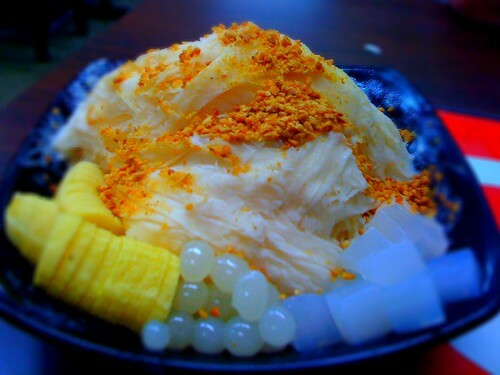 Next up on my 记得吃 dessert conquest list is the Banana Snow Ice. The generous serving of banana flavored snow ice topped with peanut bits, nata de coco, thinly sliced banana and pearls had me grinning from ear to ear. The wonders of the snow ice dessert lies in the snow ice itself. Aside from having the wonderful snowy melt-in-your mouth texture, the snow ice itself already carried the individual flavors, making the drizzle of any sweet flavored syrup totally redundant. I would have been more than satisfied even if there were only the snow ice and sprinkled peanut bits. The other toppings were simply bonuses.